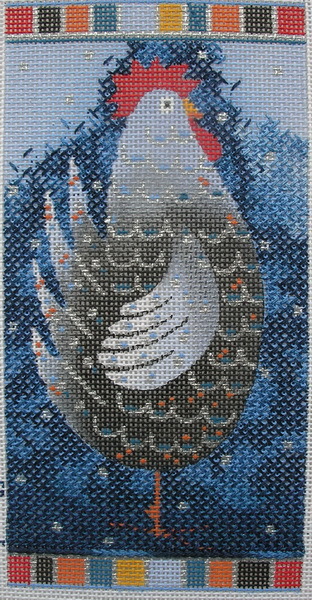 I stitched the background using four shades of ThreadworX blues and “puddled” the stitches. 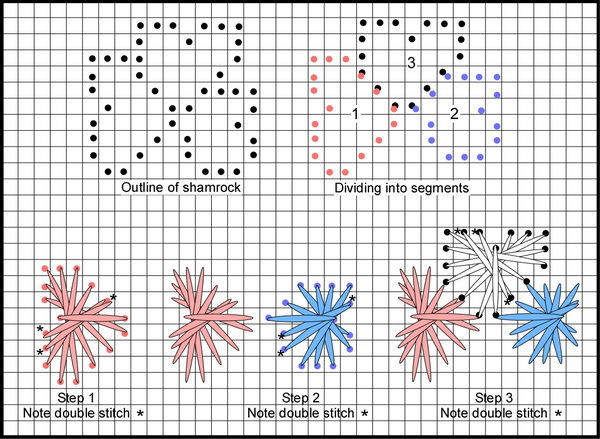 I believe the term “puddle, puddling” was originated by John Waddell (http://johnwaddellneedlepoint.com/index.html) referring to using an overdye and placing a random block of color in one area by placing all the stitching of one color in the same area rather than just stitching in rows (horizontal, vertical or diagonally). I am showing you the back so you can see where I carried the threads from one area to the next (some marked with black ovals) My puddling was not bad but then I also tried Anne Stradal’s (http://thecapestitcher.blogspot.com/) method of blending one color into the next with a few random stitches places in the next areas. This was not as successful especially at the top around the head. Sometimes one technique is enough…the KISS principle Kept It Simple Sue. 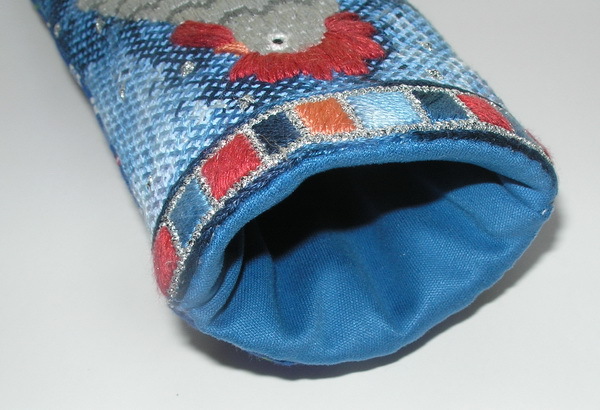 But it is an eyeglass case and unless the Smithsonian contacts me soon that they would like this piece of stitching memorabilia it probably will not be in use in 5 years. 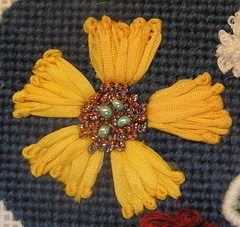 Yes, some stitching does have a shelve life and some that should not have a shelf life do too…I have a thing about seeing finished needlework at Estate Sales, flea markets, and thrift stores (my blog: https://sudukc.wordpress.com/2010/12/23/rescued/). I try to avoid these encounters as much as possible. I know our families probably will not want all out addictions but they could offer them to our friends, their friends, and just give them away at the next garage sale before sending them to the thrift store. The thrift store seems so homeless and that tugs at my heart…I don’t visit animal shelters either. But I digress (yet again) this is a whole other blog. 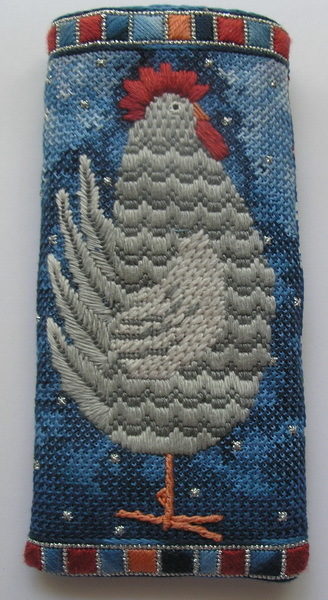 Anyway I did the background first and then stitched Henny Penny. Notice how I made sure Henny covered the background. 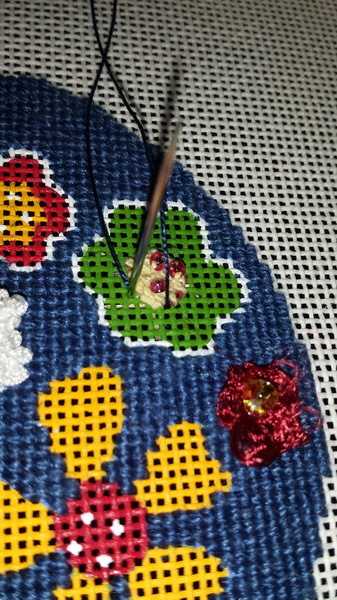 Henny was a fun quick stitching piece; but then I got a bee in my bonnet as how to finish. 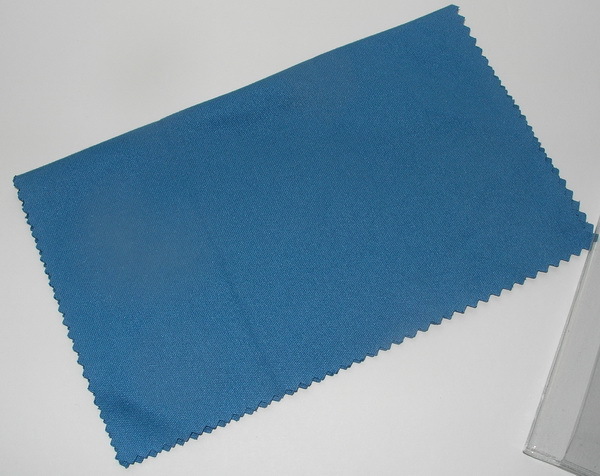 My bank gives away these lovely eyeglass cleaner towelss and they are pretty big (5×8 inches). So I headed to the bank office and of course they were out…so I just kept asking until in sheer frustration they ordered them and I got a few…let’s just say I can do a couple more eyeglass cases should I so desire…And I intend to stockpile a few more, never know when they might decide this is too good a deal to continue. I finished the eyeglass case by lining it with the eyeglass cleaners from the bank and so every time I put my glasses away they at least get the fronts wiped off. And I can pull out the lining and clean glasses, computer screens, tablets…you get the idea. Someone asked me about washing I guess you could hand wash and then when it is dry spray with cleaner stuff and let re-dry. Anyway that’s one of the many irons in my fire that can be removed…a finally finished project. 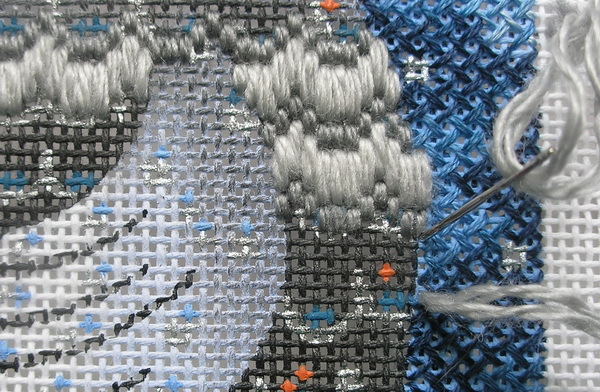 I wish I had more FFPs than Works in Progress (WiP)…because some days I feel really overwhelmed. But today I am off to work on the Value of Gray, sit outside on this beautiful fall day and read some of my favorite blogs. 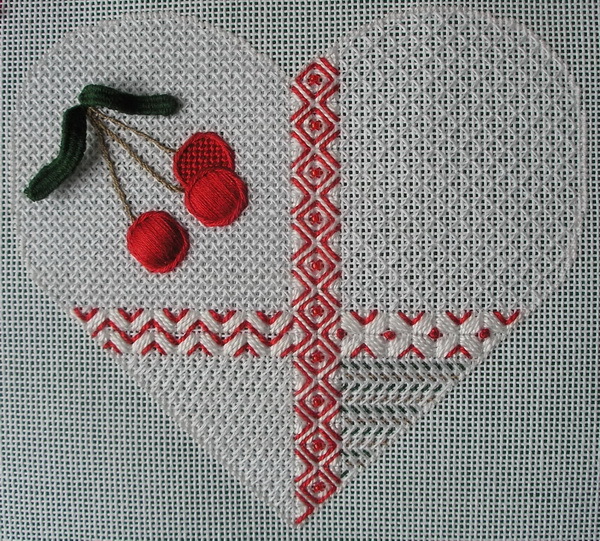 Thank you for stopping by, I hope you have time to enjoy this beautiful fall day and stitch today! It is January in the Midwest! Kids love snow and snowdays, parents hate snow and snowdays, and we stitchers don’t care as long as we have something to stitch. So after about and hour tripping down memory lane I realized I have this thing about painted canvases (I am really a geometric person or a chart stitcher; so when I purchase a painted canvas it really has spoken to my heart. 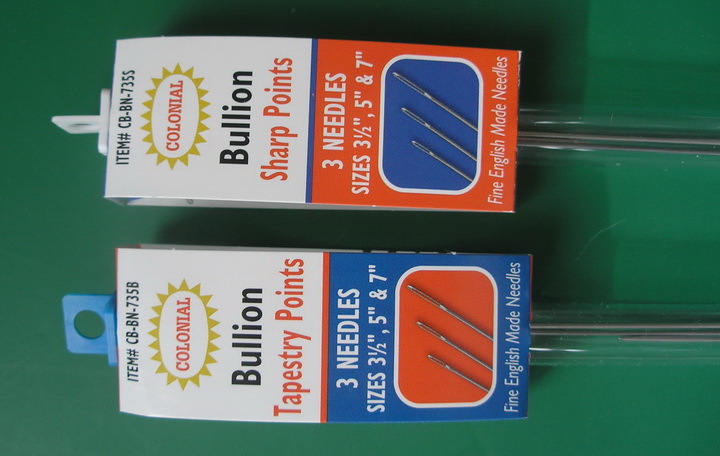 I seldom stop to think about threads and stitches at the time I purchase the canvas. I think you have to live with a canvas to decide what it will become. 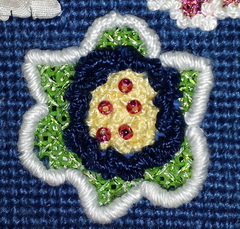 Ornaments can become pillow inserts; some canvases need to have a portion omitted or changed; and colors are not written in stone. But one thing is common among all my painted canvases…I love them! 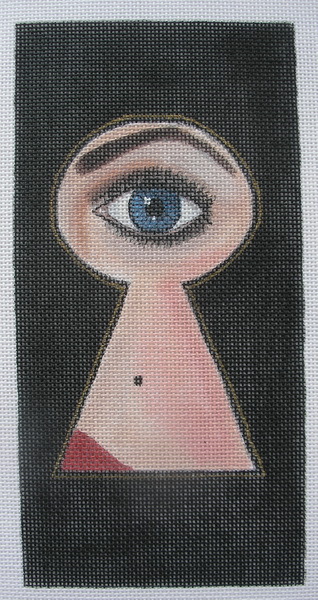 I found an old Sharon G canvas that I know I will never stitch BUT I love the canvas; All Eyes-Keyhole. I know stitching this canvas would never do it justice it is a work of art as is, so I’m taking it to the framer to have a mat cut and I am just going to frame it. I do have a question if anyone would like to weight in on this. 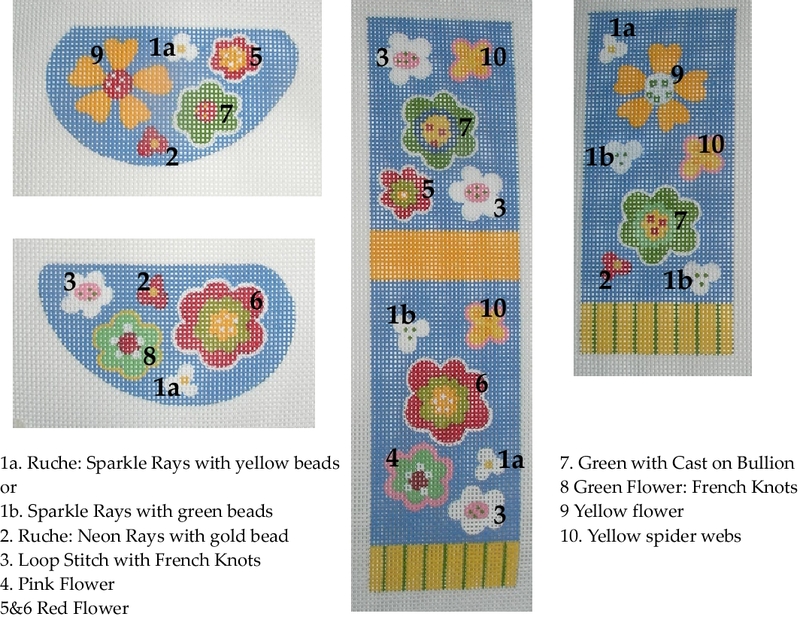 The left picture was taken on a black background, the right on a white background. I’m going to use a black mat and frame but which background do you prefer or will it matter? Periodically when I look through this stash box a canvas will jump out at me and say, “It’s my turn!” That happened when I found the bunny with a basket; the canvas was panted by Barbara & Charlotte and has the #bss 4. I don’t know if they still paint canvases or not but this one is sure cute. 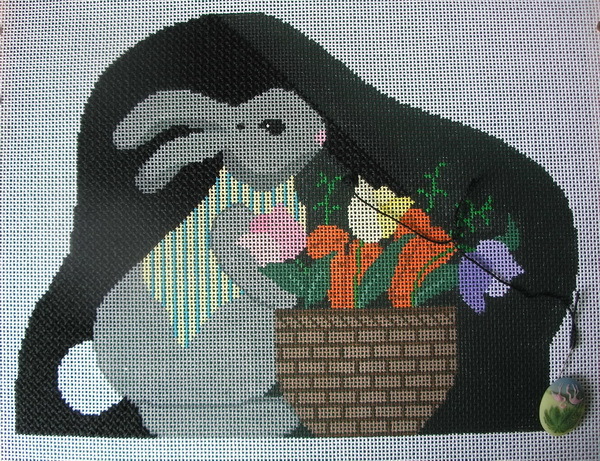 I collect Peter Rabbits (my Peter Rabbit has to have a blue coat and carrots to be in my collection), so this one will fill the bill if I stitch his coat predominately blue. 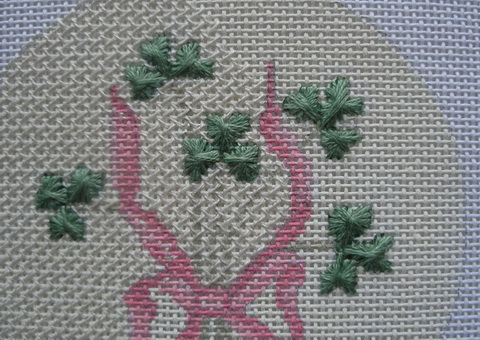 In my minds eye I could actually see the canvas stitched and finished. I measured it, pulled the stretcher bars, and started to pull the threads…All of a sudden I noticed this canvas was unusual…What size is this canvas mesh? I was thinking 14 but my mind was telling me ?? 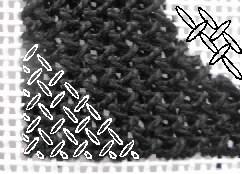 ?…it is 10 mesh! 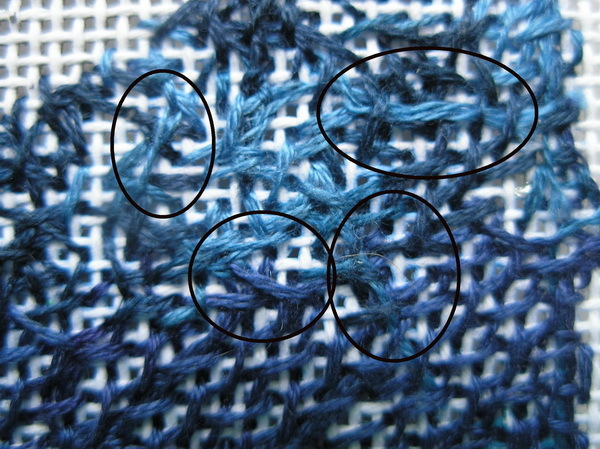 Oh my gosh I would have never guessed, I’m not sure I have threads to stitch this canvas…Oh good, a justified trip to the LNS (not that I need an excuse or justification)! Off I went, and then I hit a roadblock. 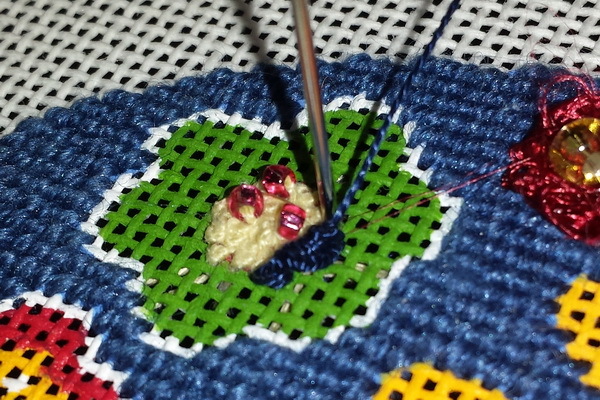 I had decided on threads for everything but the rabbit and he was proving to be a real challenge. The gray threads available at my LNS were either to blue gray or too brown gray…not a neutral gray in the bunch. Someone suggested trying knitting wool and so off I headed to a knit shop. 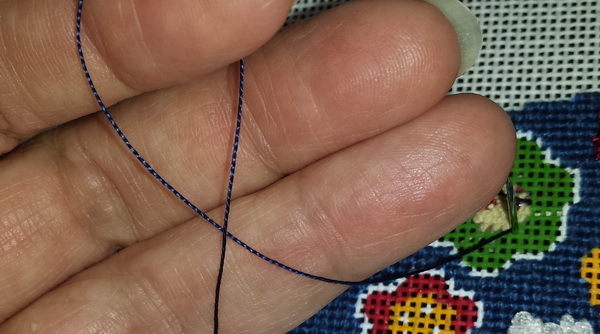 I even took a needle to check that the yarn would cover well… I found a gray that will be great. 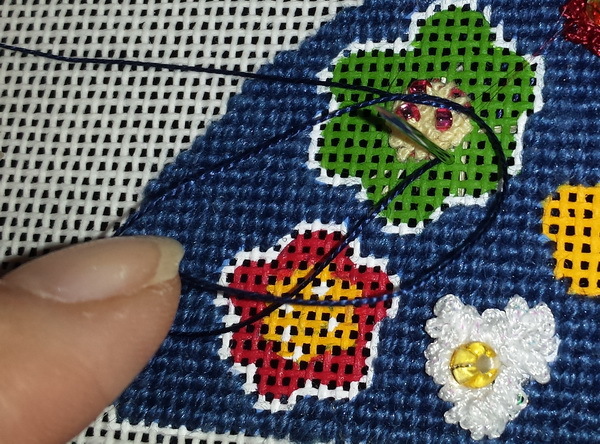 So now I have the threads and I have begun to stitch… I’m stitching this canvas front the back to the front. 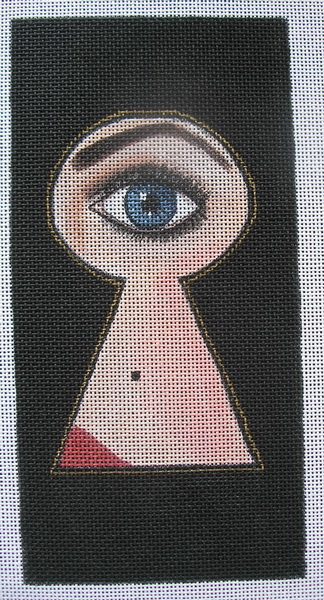 So even though this canvas may not still be available I will keep you posted on the stitches and techniques as I move along. 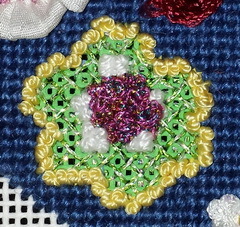 The background stitch is a woven stitch using #3 DMC pearl cotton. 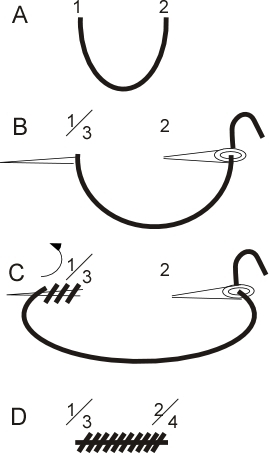 In one book it is called a T-Stitch another Woven Stitch. 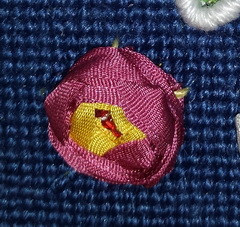 I stitch it diagonally so I guess the T-stitch would be the name using these two references: T Stitch from June McKnight; Decorative Backgrounds For Needlepoint; Self Published; 1992. 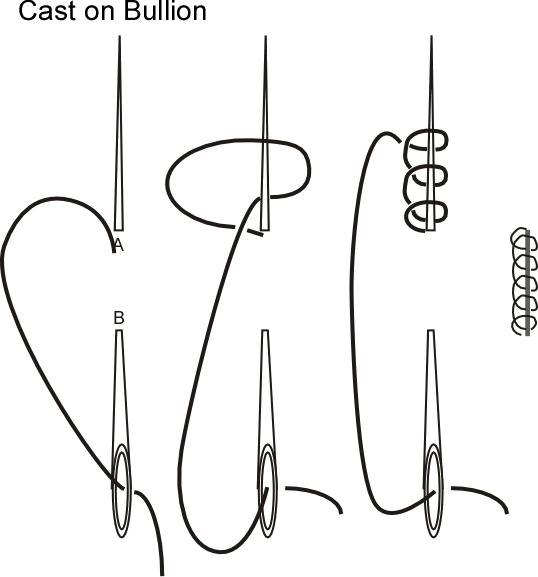 Woven Stitch from Suzanne Howren and Beth Robertson; Stitches for Effect; Self Published; 1996. 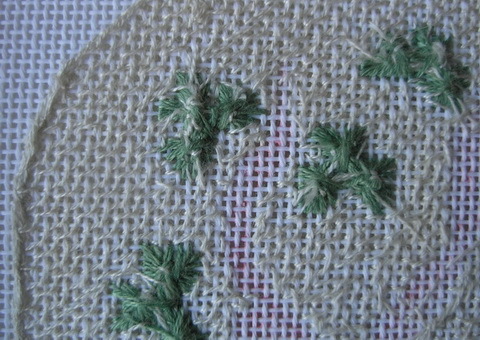 As soon as I get the background and I’m going to cover the green carrot tops, I am going to baste the carrot tops placement on the background for later stitching.